In an effort to make things fair – the undeserving are often rewarded and worse many feel entitled to what they have not earned. In an effort to make things more convenient – we have developed a culture where we crave instant gratification and the values of work ethic and long-term vision is in decline. In an effort to prevent abuse of power – we have diminished authority so much that many youths have learnt to have no respect. 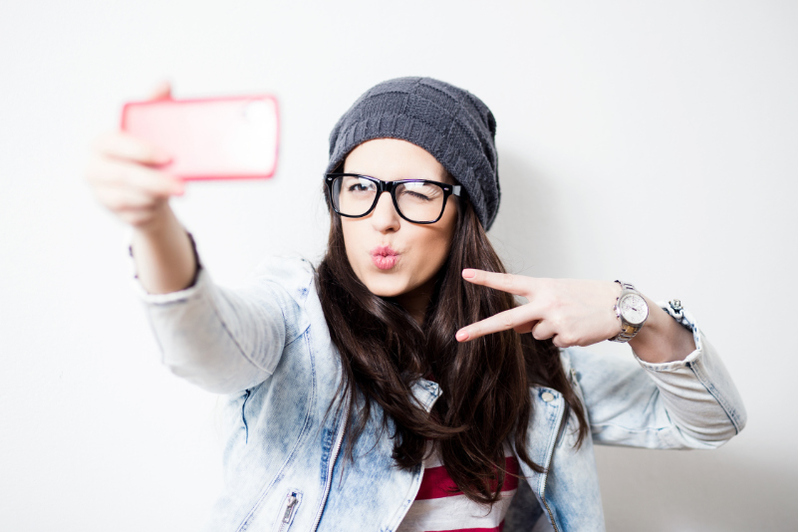 In an effort to entertain ourselves – we have allowed reality TV and social media to guide teens with their social and moral education. Is it any wonder why so many of the youth of today have such poor values, and millennials are more depressed than any other generation in spite of all our advances. Here at Shinkyu, we think the great values of strong work ethic, respect, discipline, persistence, determination and humility are just as relevant today as they have ever been. Some of these values are espoused through the system of Japanese etiquette and traditions that are a key pillar to our teaching style and class format. Students develop the qualities of work ethic, persistence and determination through our grading system, which challenges them to grow, improve and take on new skills. One of the best things about the grading systems is that it develops a long-term thinking mindset of setting milestone goals in order to achieve significant long term goals. All throughout a student’s journey, we balance positivity and encouragement as well as honest and constructive feedback. We understand the balance of positive reinforcement and discipline. Our goal is to produce responsible, well rounded martial artists who are with us for the journey. Our club motto is modern training – traditional values. With this in mind, the etiquette and traditions that foster the good values is an important part of our style and the student experience. Many would argue the development of strong character is far more valuable to a student as a person than the physical skills they will learn. After all, they will use the character they will develop through karate every single day of their lives, but they may never actually use the physical skills they learn. 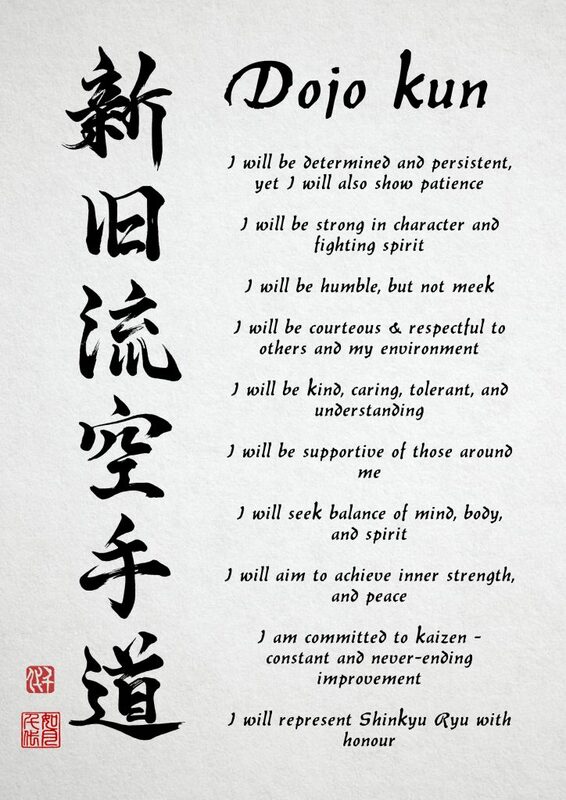 These values are summarised in our dojo kun. Not training hard or worse missing training because you don’t feel like it. Blaming others for your own shortcomings or failures, because it is painful to embrace our weaknesses. Cheating in the game at the end of class in order to stay in longer. Wanting to get the next belt because you want to receive the recognition of an award rather than actually wanting to become better. Boasting or being arrogant about your abilities in order to make you feel better about yourself. as opposed to being humble and feeling within yourself that you are working hard to get better, which is what truly matters. All of these things satisfy certain desires in the moment, but in the end, they are not making you a better person but rather a weaker one. We have all indulged at least a couple of these behaviours at some point, some only tempt us for a moment, but others you will need to battle against to become a better person. The first step towards developing stronger character is developing a sense of who you would like to be as a person and how you would like to feel about yourself. A good way to start this process is to choose role-models and then think about what traits they have that make you admire them. Don’t try to be your role model, rather simply adopt the traits that you feel make them virtuous. The second step is recognising what behaviour is taking you closer to your ideals and what behaviours are taking you further away from them. Taking responsibility for yourself, your character, your successes, your failures and short comings and finally, you duty to constantly improve yourself is the underlying principle behind all personal development and character development in karate. The real benefit of karate is not what you learn but who you become through learning it. Lastly, parents should also endeavour to adopt the principles of the dojo kun even if they are not training especially when they are in the dojo. It is important that they set a good example for their children. Karate is not a sport like football where parents can shout from the side lines and be disrespectful to others as par for course. The etiquette and traditions of Karate are often surrounded by a mystique of the Japanese sense of honour and sense of politeness. In Shinkyu our goal is to be more pragmatic, so rather than blindly following traditions for the sake of them or worse inept instructors hiding behind dogma of statements like “Don’t question your Sensei” which is frequently said in other clubs. In Shinkyu we want our etiquette to be purposeful and help develop character. The most important key to making this work is good, respectful communication between you and your Sensei. Too often problems occur when a student doesn’t understand a Sensei’s decisions or the reasons behind certain rules and etiquette. In these instances ask your Sensei. Obviously, you need to be respectful and ask at an appropriate time. Good communication can prevent frustrating situations for both the instructor and the student. It is, therefore, important that you ask your instructor about points that you don’t understand in class. But equally be careful not to rudely challenge your instructors teaching or worse flat out disagree with them, especially if you think you are being smart. This kind of confrontation does not build a stronger student/teacher relationship nor does it help anyone else in the class. Most of the time this results in the student looking rude and disrespectful in the eyes of both their peers and the instructor and in my experience the vast majority of times they are left with egg on their face once the instructor explains their reasoning. Instead ask privately “I am unsure about the point you just made. I would have thought it would be better to do this?” This gives the instructor an opportunity to explain their reasoning and if they feel it is important they may share their answer with the rest of the class too. This is also far more respectful and if there are other factors you didn’t consider you haven’t embarrassed yourself in front of the whole class. In the modern world, it is easy for students and parents to lose track of the balance between the instructor providing a service and the instructor deserving respect. The instructor is there to help you and in certain ways serve you. What is important to understand is that part of that services is to pass on good values including respect, patience and discipline. This may mean the instructor may not give you what you want (as a paying customer), instead they will endeavour to give you what you need to become a better student. This may involve turning you down for gradings, disciplining you, and pushing you out of your comfort zone. Every lack of discipline effects every other discipline, and every new discipline effects every other discipline. Karate has lots of small disciplines of which there are many listed below, while most have distinctive purposes they also build a student’s discipline “muscles”. All the small disciplines like responding with “Hai”, standing in Heiko dachi and bowing at the door all add up to make bigger disciplines like always training hard easier to take on. Mastering these bigger disciplines will lead you to success but it all starts with small disciplines. Sensei is simply Japanese for “teacher”, but more accurately it means “One who has gone before”. Therefore Sensei is more of a term of respect rather than a title that bestows authority or power. Respect and being grateful to your instructor is key to being a good student. Your instructors are not infallible but remember they are there to help you and deserve your respect and gratitude. Bowing is again a show of respect. It is definitely not religious; it is more like shaking hands on a promise to be respectful, helpful and courteous. Like shaking hands, your should take your time to do it right in order for it to actually mean something. A rushed handshake without eye contact actually leaves the recipient with a worse impression of you than when you started. Likewise slapping hands on your thighs when bowing or rushing a bow is exactly the same. When do we do a standing bow? Whenever we leave or enter the dojo. This is a show of respect for the place that we train in. Like a handshake, it is a promise that we will follow the rules of the dojo and the club. Whenever we start or finish working with a partner, whether in drills or sparring. In points sparring after someone has scored techniques on you that either overwhelmed you or potentially would have incapacitated you if they had been real. Before and after performing a kata. Whenever we move out of turn. Ie if the instructor tells you to move to a different spot bow before you move. Before and after receiving an award or grading from an instructor. When in lines students should always stand in Heiko dachi. While Heiko Dachi actually interprets as parallel stance, we prefer to call it “ready stance” describing its purpose rather than its form. It is important that students feel comfortable and natural with their knees bent and their weight on their toes which enables them to spring into action quickly hence “ready stance”. It is important that we condition ourselves to be in this “ready stance” in class and also whenever we suspect that we are in danger. Hai is the Japanese word for “yes”. Whenever your instructor gives a command we ask students to respond with “hai”. This serves two major purposes: Firstly responding lets the instructor know that you understand the instructions, and secondly it builds confidence and comradely by everyone speaking up in unison. Formal lines are a discipline which helps the instructor organise and conduct classes. The tradition of standing in grade order harks back to feudal Japan when beginners lower ranked soldiers would stand close to the door so that if the dojo was surprise attacked they would fight first giving the more experienced soldiers time to prepare. Obviously, this is not relevant in modern times but standing in grade order still serves to purposes: it makes it easy for the instructor to split the class for exercises without having to move everyone and it shows respect for those who have advanced to higher grades. While it is up to the instructor’s discretion whether other drills are formal or casual, the performance of a kata in its entirety is always a formal affair. Hence the need to bow in and out of the kata. Students are expected to maintain focus while performing kata even in practice. Traditionally higher grades are afforded more respect and some minor privileges. While this is often misconstrued as a reward for their achievement that is lorded over lower grades, the exact opposite is true. The additional honours bestowed upon higher grades are for continued good example they should be setting for lower grades to follow and as a reward for helping out in class more. Having an inflated ego because of your grade is not the example to set. Higher grades should endeavour to be humble. Asking instructors or students who are several grades above your own can be seen as arrogant or even as a challenge to their position. As a result, it is poor etiquette to ask instructors or higher graded students several grades higher to spar. If you feel that sparring with higher grades or even the instructor would be of benefit to your training and development then you need to ask them in a more subtle and respectful way, I.E. “I want to work on my sparring I would really appreciate if you could help me.” The higher grade can then choose the best way they can help you which may be to spar you (although it may not be). Being open minded and always on the lookout for new information, “Martial technology” or a deeper understanding is one of the best traits a martial artist can adopt. This means being open minded to concepts and techniques learnt from other styles, different instructors and lower grades. Don’t dismiss ideas help or advice just because it was dispensed by a lower grade. We are all here to help each other, however, be very care you are not being condescending if you are offering advice, especially if you are a lower grade and don’t get upset when people don’t immediately adopt your advice. In spite of being based on traditional karate, Shinkyu karate is a truly modern martial art and has adopted techniques and training ideas from kickboxing, judo, jiujitsu, krav maga and even a little aikido. We were founded on a core principle of being open minded. But this also means you must be discerning, especially about what you hear from sources outside the club. Poor behaviour like pushing for a grading usually manifests because a student is more concerned with receiving the recognition of grading than actually getting good at karate. We are all at times motivated by the prospect of recognition but do not let this desire eclipse the desire to improve yourself and to be a better martial artist. The belt you wear is merely a measuring stick. Who you are, what you can do and who you are becoming is far more important. While climbing the grade ladder is great motivation and becoming proficient at the syllabus is an important feature of training, it can simultaneously the cause of some of the worst behaviour. There is far more to grading than just being able to do the syllabus requirements. The syllabus is not a measure of your character, personal improvement, training ethic, or even the true depth of your understanding. It is common for students to look sideways at others and judge for themselves that they are better than someone else and deserve to grade because they can beat them in sparring or they got a higher score in kata at a tournament. Of course, these are not the only measures of a martial artist’s worthiness for their next belt. But more importantly, this kind of mindset distracts you from focusing on yourself and your own training. Lastly, if you are taking a walk through a forest and someone overtakes you does it spoil your walk? Be concerned about yourself and your own progress, enjoy training and improving. You should never ask questions like “when am I going to grade?” instead ask “What do I need to work on in order to grade?” The second question assumes your responsibility for your progress which is an important trait to develop. Pressuring instructors to grade you or your child is rude and awkward. It displays a poor recognition hunting mindset. Again you can ask what you need to work on, but asking multiple instructors “when will I be grading” is not only the wrong tact but it can be seen as trying to catch different instructors out or trying to find the most lenient instructor. Besides instructors always consult with each other regard the grading of shared students. Our syllabus, by design, is broad and covers 5 areas of training fundamentals (basics), combinations, sparring, self-defence and kata. But as broad and as comprehensive as it is there is so much more to becoming a good martial artist than just learning how to pass a test. Countless times we have seen students focus almost exclusively on what they will be tested on in their next grading, this leads to only a superficial understanding of karate. Like cramming for an exam – the student retains little of what they learn once the test is over. The dojo is a place of learning, as a discipline to prevent sloppy or lazy behaviour students should not sit on chairs or lean on walls whether they are sitting or standing. Additionally, as a courtesy to other students and the instructor, students should line up quickly. Do not make people wait for you. If people are waiting for you, you should always run. Not to do so is to presume that your time is more important than your instructors and your peers. This is as practiced in traditional training in Japan. This is by no means an exhaustive list of all the etiquette and traditions that we can apply to our study of karate. Equally, we have seen students act like slick lawyers trying to manipulate the rules, etiquette and traditions to justify their actions or get their way. We must follow the intent and values behind the traditions and rules. These principles are what should guide our journey.